Global mergers and acquisitions in the telecommunications sector reached $303 billion in the first 10 months of 2005, the highest since 2000, according to Dealogic. Cross-border M&A; volume more than doubled in the first 10 months to $109 billion and accounted for about 36% of all activity in the telecom sector so far this year. The proposed acquisition of O2 of Britain by Telefónica of Spain for nearly $32 billion, announced on October 31, is the biggest telecom deal of the year to date. O2 is the mobile-telephone service provider spun off from BT, formerly British Telecom, in 2001. 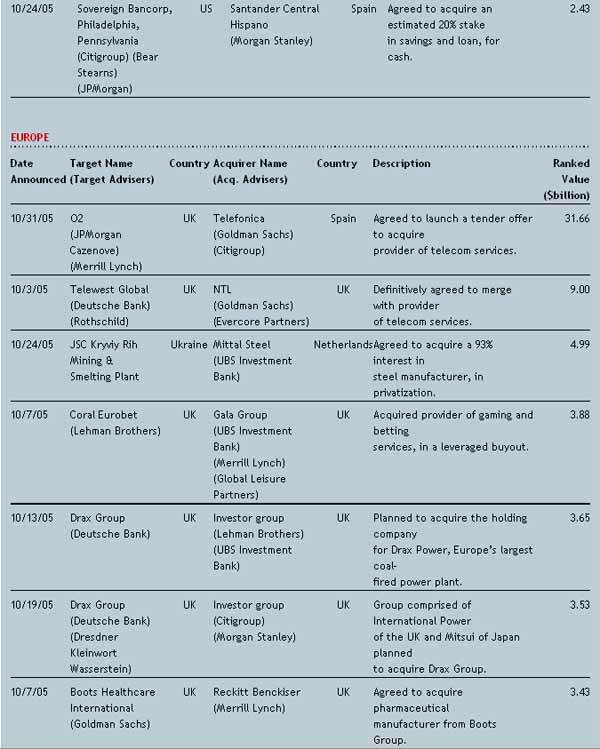 Telefónica’s bid was the largest overseas M&A; deal ever launched by a Spanish company. Banco Santander Central Hispano’s acquisition of Britain’s Abbey National last year was about half the size. The acquisition will help Telefónica to expand, not only into the UK and Ireland but also into Germany, where O2 is the fastest-growing mobile-phone company. “We are entering into the two largest markets in Europe with critical mass,” says Cesar Alierta, chairman of Telefónica. He says the deal will give the Spanish company geographical balance, with its expansion in Europe following its foray into Latin America. Earlier this year, Telefónica acquired a majority holding in Cesky Telekom of the Czech Republic for about $3.3 billion. The Spanish telecom has about 145 million subscribers worldwide, while O2 and its subsidiaries provide service to about 25 million customers. If the O2 deal proceeds as planned, Telefónica could push T-Mobile of Germany out of second place among mobile-phone companies with international operations, according to a report by Martin Gutberlet, principal analyst at Gartner Deutschland in Munich. Vodafone of the UK is the largest in terms of subscribers. Vodafone announced on October 31 that it has agreed to sell its 100% interest in Vodafone Sweden to Telenor, a pan-Nordic telecom services provider, for about $1.2 billion. Telenor is the largest telecom company in Norway and has significant international operations. The Telefónica offer for O2, which was made at a 22% premium, puts greater pressure on Vodafone and T-Mobile to achieve growth outside their current markets, Gutberlet says. Expect more mobile operators to be acquired during the next two years, he says. 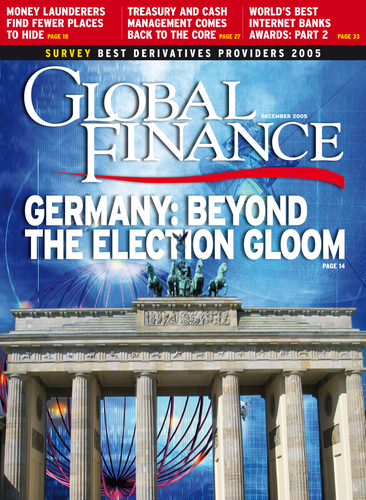 Telefónica’s previous push into Germany, through a joint venture named Quam, ended in failure, Gutberlet says. 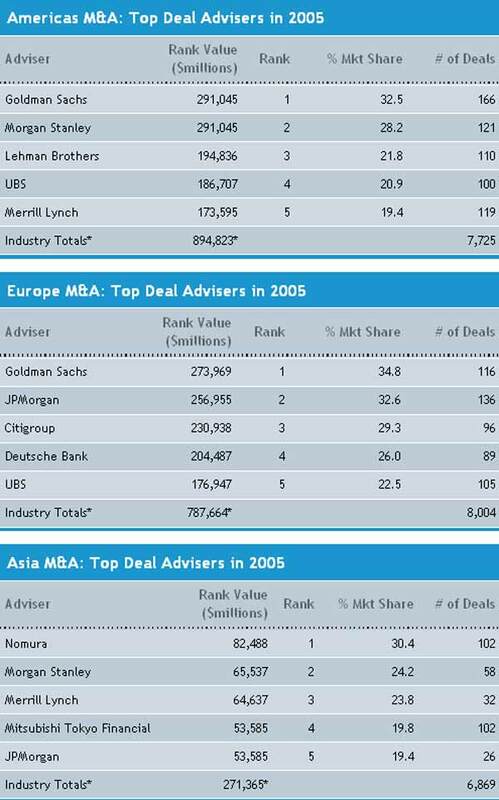 Morgan Stanley leads the advisory rankings in telecom M&A; deals in the first 10 months of 2005, with transactions valued at $90.4 billion from 43 deals, according to Dealogic. JPMorgan is second with $79.9 billion from 35 deals, and Merrill Lynch is a very close third, with $79.2 billion from 25 deals. 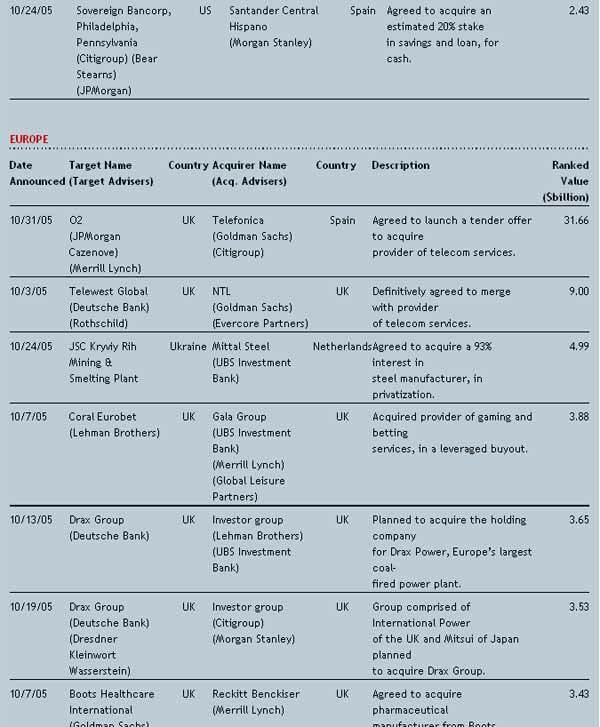 In the October 31 transaction, Goldman Sachs and Citigroup advised Telefónica, and JPMorgan Cazenove and Merrill Lynch advised O2. “O2 and Telefónica have no overlapping territory, so they will be able to offer our customers better roaming and better services around the world,” says O2 chief executive Peter Erskine. The O2 board recommended that shareholders accept the Telefónica offer. 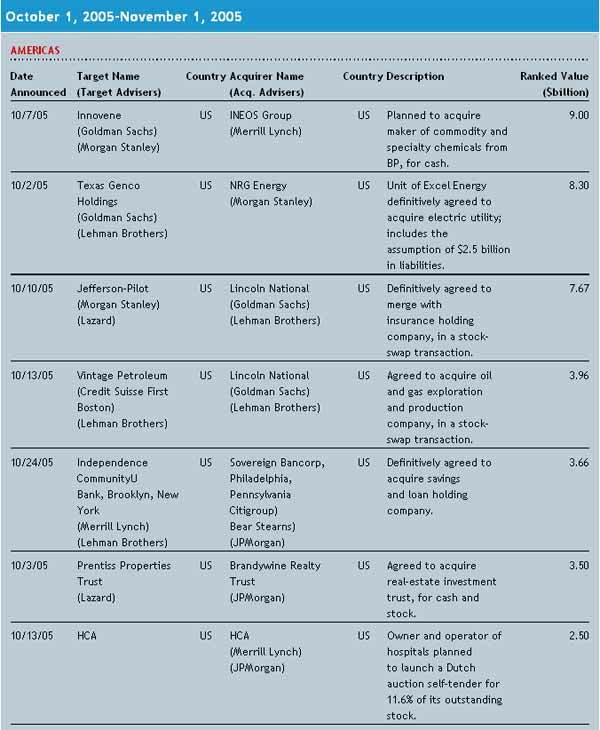 The companies expect the deal to be completed by February 2006. The Spanish telecom is unlikely to make any additional acquisitions in the near term and is expected to shelve its previously contemplated offer for Tunisia-based Tunisie Telecom. Telefónica says its strategic goal is to provide its shareholders with both growth and cash returns. * Figures may not add up, as more than one bank typically obtains credit for any one transaction.